…like…like maybe I won’t finish that sentence. 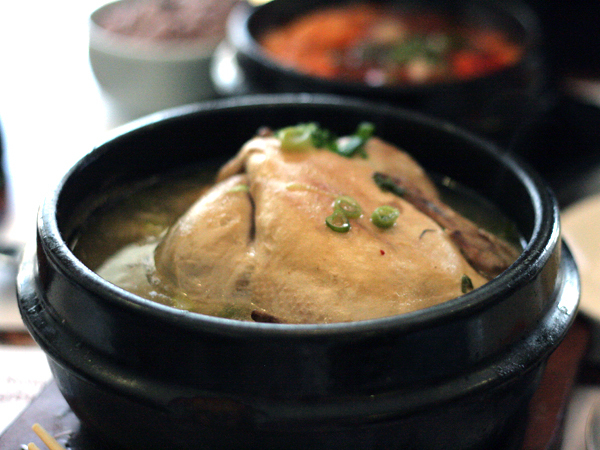 Sam gye tang (삼계탕) is a Korean chicken soup that, like most chicken soups, serves a medicinal purpose. 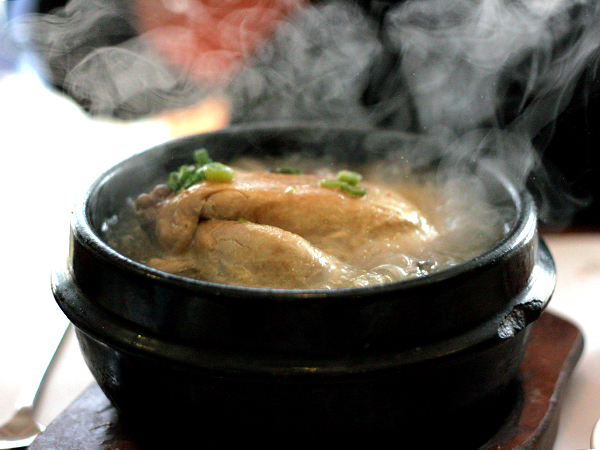 However, Koreans traditionally eat sam gye tang during the summer to replace nutrients that are lost by sweating, which sounds disgusting, rather than eating chicken soup during the winter to loosen mucus and open inflamed sinuses associated with cold and flu, which sounds equally, if not more, disgusting. 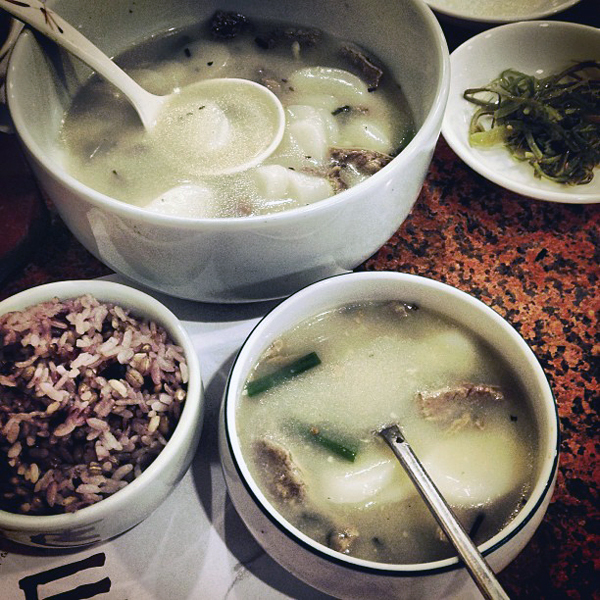 In either seasonal case, Seong Buk Dong serves sam gye tang all the time. Or at least, all the time that they haven’t run out, like last week when I tried to phone it in because I didn’t want to share the Koreatown restaurant’s tiny, cramped airspace with germ-ridden heat-seekers and expose myself to toxic, viral flumes. I ended up eating two glasses of wine for dinner at home that night because that’s as effective for flu prevention as a vaccine, not for the vitamins and antioxidants, but for the isolation that results from shame. We originally found ourselves at Seong Buk Dong for the first time on New Year’s Day (not our first first time, but first time in a very long time). Seeking the annual New Year bowl of dduk gook (rice dumpling soup) at a nearby restaurant was a Hail Mary attempt by a disgrace to the race who was “too busy” to drive to Orange County and spend time with family engaging in legacy-preserving traditions. The dduk gook, thick broth clouded with carbs, was restorative and sufficiently heritage-reminding. 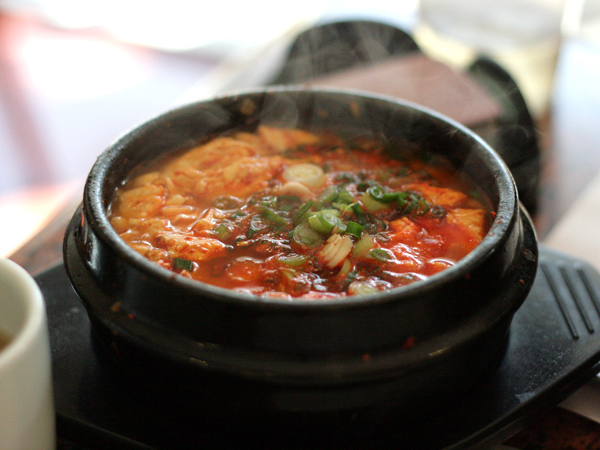 The soon doo-boo jjigae (spicy tofu hot pot) was good. But it was the discovery of sam gye tang on the menu that has brought us back multiple times in the weeks since New Year, publicly facing the epidemic precisely from which we were seeking prevention. I don’t know how Seong Buk Dong’s sam gye tang compares to others. I only have my Mom’s version as a baseline, but hers was so long ago in my memory that it isn’t a fair comparison. I do know that Seong Buk Dong’s soup comes out boiling (literally) hot, the chicken falls apart in the pot, and tiny gnarled pieces of ginseng make the whole thing legit. The array of ban chan, which changes each time, and the bibimbap aren’t all that remarkable, but everything else has been pretty good: dduk gook (rice dumpling soup), sam gye tang (chicken soup), galbi tang (beef short ribs soup). The twon dishes for which Seong Buk Dong seems to be most well-known are galbi jjim (braised beef short ribs) and go-deung-uh jorim (spicy braised mackerel – very fishy, very funky). All of the “spicy” dishes are very spicy. “Mild” still means spicy. If you discount that multiple line items under a single section are really just different flavors of the same thing, e.g. beef, seafood, vegetarian, etc. 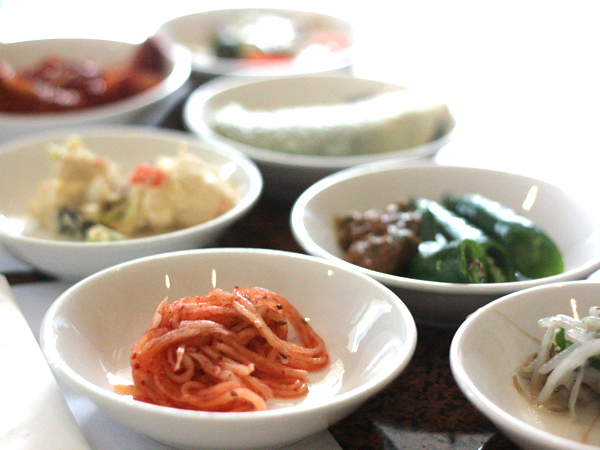 “flavors” of soon doo-boo jjigae, the menu is fairly small. You can memorize it all after looking once, which means you never again have to touch what is usually the germiest thing in a restaurant after the condiment bottles. p.s. Parking is somewhat chaotic in the tiny lot, but there is a valet. When there is a wait to be seated at one of the only nine or ten tables, a server will take your order outside and time your food with your sitting down. No alcohol. Visa/MC only. Open late. According to a sign on the door of the dry cleaner next door, you can get your Uggs dry cleaned there. That’s a bonus if I’ve seen one.